Arrow-wood (Viburnum dentatum) is sometimes also called Southern Arrow-wood or simply Arrowwood, to distinguish it from some other members of its family with somewhat toothed leaves and similar histories. It can grow to over 12' and be almost as wide. Because it can take a variety of soil conditions (except exceedingly dry) and varying amounts of shade, it is often used as a landscape plant. It has few issues and has pleasant looking (but not smelling) blooms which are quite attractive. It can take a fair amount of shade, but you get many more blooms when it gets full sun. Because of its popularity as a landscape plant, this native has spread outside its native range and now is planted in many parts of the country. The clusters (called umbels) of white flowers can be quite showy. They are primarily visited by an array of small bees, flies, and beetles, despite their less than pleasant smell. The flowers are typical of viburnums in being white, with 5 petals, 5 sepals, and 5 stamens. An umbel of Arrowwood flowers. The resulting berries (called drupes) are bluish to black and eaten by a variety of wildlife species, including up to 35 different types of birds. The fruits are about 41% fat with high carbohydrate and protein concentrations, something making them popular with many birds, especially during migration. The toothed leaves (thus V. dentatum) and drupes of Arrow-wood. The opposite branching and toothed leaves are attractive. So are the multiple stems that emerge from the ground. Each stem tends to be very straight and even in diameter, a trait that supposedly made them popular with Native American Indian tribes for making of arrow shafts, and thus the name. The straight and even shafts of Arrow-wood. Interestingly, it is hard to find real documentation for this use of the plant. While it makes perfect sense, with not just their straight growth and diameter, but also their hardness and ability to straighten them out when green, it is not really recorded, though often repeated. For instance, Daniel Moerman, in his monumental work documenting "Native American Ethnobotany" makes no mention at all to this. He does however list Arrow-wood being used by the Ojibwa as an element of their smoking mixtures called "kinnikinnik." Moerman also documents the Iroquois women taking it as a contraceptive and as a poultice for swollen legs after childbirth. Southern Arrow-wood has variable Fall color. Viburnums have opposite branching, which is uncommon among our woody plants. Formerly in the Honeysuckle (Caprifoliaceae) Family, they are now part of the smaller Adoxaceae Family. It is currently in bloom in many parts of our region and is easy to spot. While we may may like it for its aesthetics (and it is not favored deer browse either), it is the wildlife that gets the most benefit from our planting it. In addition to its popularity with the birds, 104 caterpillar species also use viburnums such as Arrow-wood. These insects feed most of our birds and bats as well. It's nice when we can plant something that we can like, but that can serve as habitat value as well. Arrowwood leaves in the Fall. The Eastern Gartersnake (Thamnophis sirtalis) is a common, mid-sized snake, usually between 18 - 28 inches long, though the record length is 49 inches. It is normally found near water, but is extremely adaptable as to habitat, including being tolerant of people and disturbance. This makes encounters with them not uncommon. 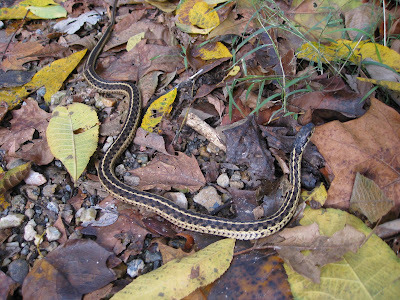 Gartersnakes are variable, but generally have stripes and some dark checkering to them. They look similar to their close cousins, Common Ribbonsnakes (Thamnophis sauritus) who are more slender, more closely tied to water, and have a white spot in front of their eyes. Gartersnakes not only lack this white spot, but are thicker and their lip scales are light colored, but separated from one another by dark vertical lines that border each scale's edges. Common Ribbonsnake, note the white spot in front of its eye. 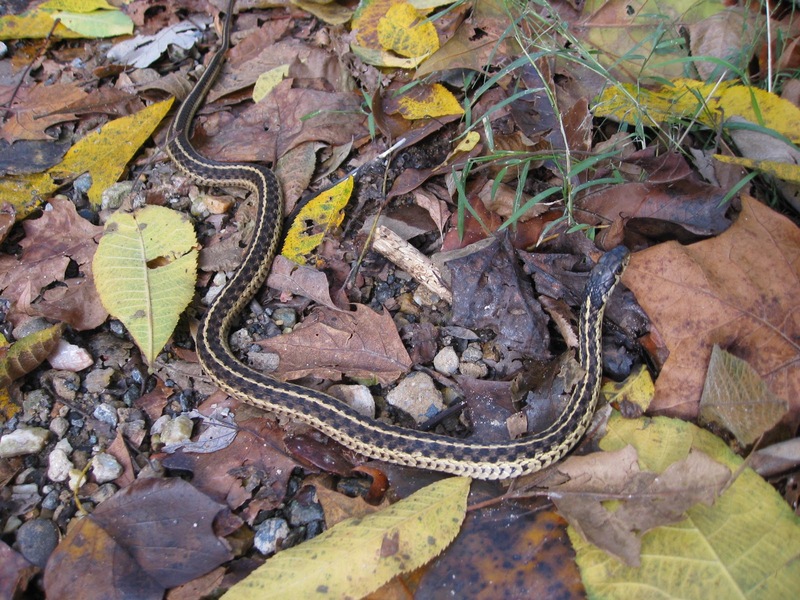 Eastern Gartersnake, note the dark stripes between the scales on their jaws. Gartersnakes are some of our most cold tolerant snakes, often active when it's too cold for other snakes to be out. They are among the last snakes to go find dens and overwinter in a dormant state. Their diet consists of various small creatures: amphibians, occasional rodents, invertebrates, but their favorites are earthworms and fish. They don't like to climb trees, but are certainly capable of doing so if the need arises. In late summer, they give live birth to 9-85 young, with the larger snakes producing the most offspring. If they're lucky, they can live up to 14 years. When encountered, they may either try to hide at first or flee (their stripes causing them to be lost very quickly in the underbrush). If cornered or if they feel threatened, they will put on quite the show. They often flatten their heads and puff out, trying to appear as big and bad as they can. They are capable of biting, but their teeth are small, so the bite is not very painful at all. Occasionally some people have a slight reaction to the saliva, causing a mild itch, but this is very uncommon. I'm always more worried about getting musked. Many snakes are capable of exuding a very foul, smelly substance that most creatures find unpleasant. It doesn't wash off very easily as well. Since they sometimes defecate on you as well, it is always best to leave them alone. Because I occasionally have to remove them from harms way and people, I have unfortunately been the recipient many times. Eastern Gartersnakes are quite the survivors. Their adaptability in habitat, weather conditions, and diet allows them to be one of the most commonly encountered of our snakes. Perhaps it is fitting then that as of February of 2016, they were declared Virginia's official State Snake. Stinkhorn fungi (Mutinus spp.) can emerge throughout most of the late spring and summer, usually after extended rains. The latest batch of wet weather has meant many fungi have emerged, the Stinkhorns among them. Though they start from egg-like structures (which are reportedly edible), they spring up and change shape quite quickly and dramatically. Mature Stinkhorns have a distinctive shape and strong, distasteful smell, thus their names. The name of their Genus Mutinus refers to a Roman phallic deity, and this shape has led to many common names and lore. Sometimes called Phallus Fungus, they also bear such names as Devil's Dipstick, Dog Stinkhorn, and many more vulgar phallic names. Found on both sides of the Atlantic, their emergence sometimes offended peoples chaste view of the world, particularly during Victorian times. One story relates that Charles Darwin's eldest daughter Etty found them particularly offensive, collecting them and burning them, lest they offend "the morals of the maids." Luckily, these fungi are short lived, the unpleasant smell and structures disappearing and melting away soon after emergence. The shape and smell serve a purpose. They attract flies and other insects to their slimy tops. These creatures then get the spores stuck to them, helping disperse them so they can start new colonies elsewhere, often in decaying wood such as mulch piles. Gardeners who find these apparitions in their well-mulched gardens, often panic, but these fungi cause no harm to the living plants. White Fringetree, often times just called Fringetree (Chionanthus virginica), is usually a short multi-stemmed shrub, but occasionally can grow as a single trunk small tree (up to 30'). Often planted for its fragrant floral displays, the drooping white flowers also give it the names of Old Man's Beard and Grancy Graybeard in the South. It's Genus name translates to "snow flower" and refers again to the grande floral display it often gives. The flowers themselves consist of 4 white petals that droop and are often slightly twisted. They hang in large numbers, with male and female flowers almost always on separate trees. Their fragrance along with their massed flowers makes them standout. They are in peak bloom right about now. If the flowers get pollinated, the female trees produce large blue to black fruits. These are technically called drupes and consist of a thin, but juicy, flesh around a fairly large stone. They look a bit like olives, which makes sense as they are in the Olive Family (Oleaceae). Although not poisonous, accounts vary as to whether they really are edible. Fringetrees have been used medicinally by indigenous tribes. The Choctaw for example made a decoction from the bark that could be used to wash wounds, cuts and bruises. It could be applied as a poultice and was used to wash sores as well. The Koasati people also found the bark useful for cleaning cuts. During the Civil War, Confederate Doctor Francis Porcher, tasked with finding home grown alternatives to goods no longer available due to Union blockades, described using Fringetree to treat fevers, cuts, wounds, and ulcers. It has also been used as a folk remedy for liver and gall baldder issues. One of the last trees to leaf out, it remains a popular landscape shrub, and has been since first cultivated in 1736. While male trees are considered showier, female trees produce the decorative fruits. Both are extremely fragrant. Eight different caterpillar species feed on it.